En mai dernier, nous avons reçu Cheuk Kwan à la chronique Regarde les Chinois. Ingénieur de profession, Cheuk Kwan est mieux connu aujourd’hui pour sa série de films Chinese Restaurants traitant de la dispora chinoise à travers le monde vue à partir du restaurant familial. Se décrivant comme internationaliste, M. Kwan a grandi à Singapour avant d’arriver au Canada comme étudiant en 1969. En 1979, il a participé à la réaction à la controverse des Campus Giveaways du W-FIVE. Après un passage à Montréal, il a vécu successivement en Arabie Saoudite, au Japon et à Hong Kong, avant de revenir au Canada. Je l’ai rencontré à la sortie de la projection de son film au festival Accès Asie et on a parlé de ses films, les diasporas, de « chinoisitude ». Last May, we welcomed Cheuk Kwan to our Regarde les Chinois column. Engineer by trade, Cheuk Kwan is better known today for his film series Chinese Restaurants on the Chinese diaspora seen through the family-owned restaurant. 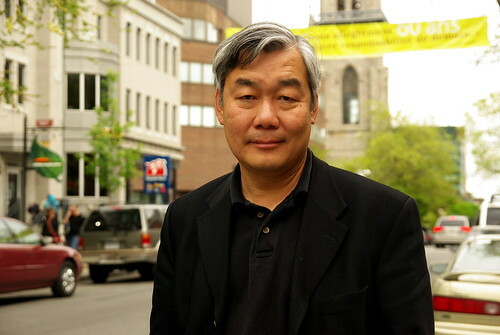 A self-described internationalist, Mr. Kwan grew up in Singapore before arriving to Canada in 1969 as a student. In 1979, he participated in the reaction to the W-FIVE Campus Giveaways controversy. After a stint in Montreal, he lived successively in Saudi Arabia, Japan and Hong Kong. I sat down with him after the screening of his film at the Accès Asie festival and we talked about his films, diasporas and “Chineseness”. Comme les Chinois: Hi, what’s your name? Cheuk Kwan: My name’s Cheuk Kwan and I’m the filmmaker behind the Chinese Restaurants series where I went to thirteen countries and made fifteen stories about the Chinese diaspora via the lens of a Chinese restaurant owner in each place. That’s my favourite Cantonese dish. (laughs) Just because it’s very rare that you get a nice fresh… swimming fish, anywhere. Everytime you get that, it’s very treasured and the best way to bring out that taste, sweet taste of the fish, is just a very simple steaming with soy sauce and ginger and scallion. To me, it’s the most true tasting that you can do with a fish. Has to be fresh of course. Well, in Montreal you can go to St-Laurent, there’s a fish store. CLC: Do you know Montreal pretty well? I used to live here. I lived here between 1980 and 1982. That’s how I met Andrew (Editor’s note: Andrew Lui, now a Montreal-based artist, who was sitting near us during the interview). I lived on Nun’s Island and I working for an engineering firm with a headquarters here. So I was transferred to Montreal from Toronto. CLC: Originally… I mean, your career is as an information technology specialist… You were trained as an engineer? I graduated with an engineering degree and then I got into – at time it was computers, information, IT was very popular. So it was very natural for me to become on that side of the industry. So, I spent twenty years until I “retired” and then make this film. No, I’m getting too old (laughs). You know what… the thing is that people… the last years I was working, I was basically a manager and the vice-president. So I was supervising 25-year-olds and I know that I cannot compete in the new languages, new technologies. The unique thing that I have was experience at managing, and one day I got tired of that, because of bureaucracy, the whole industry. I had a very bad client from the government and I said, what the hell, I’m going to do something else. That’s when I left engineering. CLC: So you got the idea to do films, or series of films. Yup. I always had that idea of… making Chinese Restaurants, for twenty-five years before I started. So this was back in the late 70s. I was… in ’76, I was in Istanbul and I went to this Chinese restaurant. It was the only Chinese restaurant in Istanbul. CLC: Is that the one we saw in one of your films? Yes, that’s what inspired me. And I had dinner there and the guidebook had said that the owner had walked from China. That was the Let’s Go Europe guidebook. And it says it’s the only Chinese restaurant in Turkey and the owner had walked from China. So this is like an urban legend. And I said, well, that’s fantastic! And so, I’ve always kept that in mind. And my second inspiration came when I was in… having a lunch in a restaurant called “Hong Kong restaurant”, in Mombassa, in Kenya. And then after that I went across the street to the Museum of Lost Treasures. It’s actually exhibition of Ming Dynasty vases recovered from Chinese boats, junks, off the east coast of Africa, during the Ming Dynasty, sunken during the Ming Dynasty. So, I said, woaw, Chinese have been everywhere. CLC: Is that during the Zheng He era? Probably after the Zheng He era. That is as you know, I was all inspired, as a kid growing up in Southeast Asia, I hear about the escapades, the adventures of Zheng He! So, I was like, it was in my background. So all these three kind of components kind of got together and gelled together. It was in 1982 that I went to Kenya. So at that time, I started thinking, someday you know, I’m going to make a story of all these Chinese that went around. Plus, growing up in Singapore, I was aware of the many Chinese in Southeast Asia. So, my father traded with Chinese in Mauritius, you know, Madagascar. So, I knew all about that kind of Overseas Chinese. CLC: So, you grew up in Singapore? I grew up in Singapore. Then, I went back to Hong Kong – went to Japan for my high school. And that’s where I learned my Japanese. Then, I came to the US for university and emigrated to Canada later on. CLC: Um, you also lived in Saudi Arabia? I did. I lived in Montreal for two years, between ’80 and ’82, working for an engineering firm, headquartered in Montreal. So, I was transferred in Montreal. And in ’82, I got a job in Saudi Arabia for an American company, an American-French company building a university in Saudi Arabia. So, at that time I thought that I needed adventure, so I thought that I had to go to Saudi Arabia to work. I lasted for about one year and then I got hired by a Japanese company to go back to Japan to work, because I speak Japanese. So, I lived there for about two years and then I went back to Hong Kong, because I’ve never lived Hong Kong as an adult. So I really wanted to… go back to my roots. CLC: Your parents were in Hong Kong? Well, they were just moving back to Hong Kong. So, my father was retiring. So, I stayed with them for two years in Japan and then I moved to Hong Kong with them. And I started my own IT business in Hong Kong, for four years. CLC: Well, it was interesting, when I asked Saudi Arabia, because it’s one of the more… exotic places you’ve lived in, for an Asian-looking, Chinese person… Was there something that was something remarkable about your experience in Saudi Arabia? No, not really, because I lived an essentially expatriate existence. In those days, Saudi Arabia was a very closed society. Foreigners couldn’t, you know… We lived in camps, construction camps. Bunch of French, Americans, Brits, you know, foreigners living together. We were very closed, very separated, segregated. So, the only life that I had with Saudis is maybe a few trips we took on our jeep through the desert. You know, during our vacation, we would go travelling around to Yemen, on the Arabian peninsula, on jeep. So, that was the only kind of contact we have. Other than on weekends, when we go to the market. But, at that time, Saudi was roughly modernizing. So what you have was kind of current Dubai, where you have the whole shopping centres, very Western. So we didn’t really have contact with the Bedouin tribes. CLC: I was told that you were an activist in the 70s. I heard that you were involved in that story with W-FIVE reporting about Chinese… Can you tell me more about it? Before that, I started an Asian-Canadian magazine named Asianadian, and with a couple of friends. That was back in ’78, April Fool’s Day, that was our founding date. (laughs) We published for about six years. It was a very avant-garde, very forward-looking magazine about culture, assimilation and political awareness among Asian-Canadians. And we did have a kind of pan-Asian mentality, promoting the united front of our Japanese-Canadians, Chinese-Canadians, Vietnamese-Canadians and so forth, and Filipino-Canadians for example. So, it was promoting the awareness of Asians. This was almost like the forerunner of Asian Heritage Month, and it was really (?) successful, and not financially of course, uh, it was a struggle. But the influence throughout the years, I’ve heard, has been tremendous. I still run into people who say, ohh, “I used to read your magazine when I was growing up”, or “(it) inspired me a lot”. Recently, somebody wrote a book about this phenomenon, the whole… the name of that book was Voices Rising by Xiaoping FAN (Editor’s note: but we found that the book had Xiaoping LI listed as its author) and she’s a professor now at Okanagan College. But, from Vancouver, she wrote this book, talks about the whole growing Asian-Canadian awareness and sensitivity in the 70s and 80s. And our magazine had a big part in the documented history of that. *** Pausing for Cheuk to say goodbye to some friends who were at the cafe-terrasse with us. Yes, it was a first time that I was… since coming here to Canada, first time that I was really in touch with my community. Yes, that’s right… Because you are now a minority in this land. And because I’ve lived in Japan, I’ve had a kind of “pan-Asian sensibility”, because I thought that, you know, old typical Chinese are very racist in many ways. They’re “oh the Japanese are a bunch of uh people”, right? So, I want to overcome that as well. Plus, the entire Asian have to overcome the whole White, the minority in a white society, mainstream society. So, that was a struggle in the 80s. And then of course in ’79 came W-FIVE. It was a CTV W-FIVE news magazine, had a segment called “campus giveaway”, and the basic premise was that foreigners, foreign students, were taking over the universities of Canada. Uh, (that) when you go to U of T, all you hear are Chinese speaks, students in engineering, in pharmacy. And as a result (according to the report), some students couldn’t get in. So, they interview some people in St. Catharines, Ontario, who said “ohhh, I got 79% couldn’t get in to U of T pharmacy!” and her father was a pharmacist: “ohhh, my daughter couldn’t get in because all these foreigners are taking over our universities”. But of course you know that in pharmacy, you have to be a resident, you have to be an (inland?) immigrant to enroll in pharmacy school. So what it is saying is that “here’s a yellow face” and “here’s a foreigner”. So, they are equating Orientals, or Asians, with foreigners. So, we got together and as a group we generated a nationwide protest movement. Then, in six months, we got an apology from CTV for racist reporting and we wanted to dispel the myth that Asians don’t belong in Canada. That we are also Canadians. And as a result, it led to the founding of the Chinese Canadian National Council. The CCNC… And I think that your neighbourhood society is one of the members. CLC: Oh, CFS (the Chinese Family Service of Greater Montreal), yes, or used to be. That’s how I came about it. CLC: And um, after that you went on with your career, had that on the backseat. Um, I’m fairly… I’ve always been involved with that. But from ’82, I’m in Saudi (Arabia), then Japan, then Hong Kong. So, I was away from Canada until ’89. When I came back, and I got involved with the Tian’anmen Square, the whole human rights in China. So, that’s where I am today. CLC: So why restaurants? Uh… why wouldn’t it be laundry houses? Restaurants are ubiquitous, just because anywhere you go, you will find Chinese restaurants. And it’s also the easiest way for a Chinese immigrant to get his or her hand wet in a new place. You can run a restaurant without speaking the language. You can get your kids to go on the front to speak English or French or Spanish to your customers. You can hide behind the counter and nobody will know and you will be ok. And because it’s a good market – you know, people like Chinese food – so you guarantee some business. Right, right. If you are smart, you create a demand for your food, which is… what marketing is all about: creating a demand for your products. So, you know, what you do is that you do like the Peru guy: an ambassador, introducing Chinese food to the society and thereby increasing your own customers. CLC: A lot of new immigrants are opening convenience stores. CLC: Did you manage to sell it to these… to TV channels? Yeah, I have more success in Asia. I sold it to a Asia-wide network (ChannelNews Asia). I sold it to a satellite network in the US. Great results, very little money, but great results. I recently sold it to Channel M in Vancouver, it’s a multicultural channel. And then I sold it to Rogers just a half-year ago. CLC: That one I heard… (it’s) Omni? Omni. Rogers owns Omni, owns CityTV now. And so it’s also got a Rogers cable network, Channel 10 or something in Toronto. But they have a few outlets and they’re buying Channel M that I was telling about, in Vancouver. So, um, I’ve also been on Telus, video on demand, in Quebec, in French and English version. CLC: Radio, did you say radio? …I don’t know! I would be bored if I go to a sun and sand. I mean, everybody would like to go to Mauritius or Hawaii (laughs). If I had to find a place to go, I would go to France or Italy. Because I really love the culture and the food there. And I think it’s very perfect to have a… you know, live in a village with a very cheap living standard. I don’t like Spain as much. Lots of people go to Spain because of weather and it’s cheap. But then my wife tells me that I would never do that, because I love big cities. You know, I have to have films, I have to have… culture. CLC: Big cities? Would you go back to China – or to China? No, no. Not at all. I don’t have that Chineseness in me that says I want to really go back to China. I see myself as more the global internationalist. So I’m equally at ease in France, in a little village in France, than in Shenzhen. Right? However, like I said, I don’t know if I would really kind of go to a quiet village to retire. Because I would miss the culture and the arts and movies and the people around. I mean, Toronto is actually quite nice as a city, as a very multicultural… As you know, fifty percent of Toronto is immigrant, are immigrants, not born in Canada. So that’s amazing… Montreal too! CLC: Do you have future projects? Uh, after the Chinese Restaurants, I’ve made a series for a Singapore TV called Expats, Asian Expats. CLC: You mean Asians who to Canada? Canada and US. So I made four episodes of that. Because they thought I was natural to do that. Because that’s the same channel who bought my film. So they liked what I did in Restaurants and they wanted me to make this Expats film. CLC: And those people belong… where was their sense of belonging? Also very very global. Because I interviewed people like Susur Lee, you know, the restaurant owner? He was chef in Hong Kong and he came over. So basically, we’re talking about people with mid-life changing, coming to a new land and how they assimilate. So that I had Indian, Japanese, Korean, Vietnamese, all kinds of people, Filipino. So these are sort of Asian expats, because their market is to Asia so they wanna show the home country where… how their natives had gone Overseas. And speaking about that, there is a… I’ve always said that my films are better received outside of China and Hong Kong and Taiwan than those places, just because, I think, first of all, as an Overseas Chinese, you have this affinity to people like you and me. You know, we sort of know that we’re born outside of China, although we have the Chinese heritage. So our view of China is very different from the people who live in China or grew up in China. And then to them, we’re foreigners, we’re like not even Chinese. Except when I need to use you. Otherwise you’re maybe forgotten. But to us, China represents what I call a mythical China that we always carry with us. CLC: A China from many many generations? The one probably of the time when you emigrated. Exactly. But it’s always that mythical China, it’s an ideal China. You know, wonderful culture, food and… that we hear from our grandparents or our parents. So, what happens is that we all carry that even though we might never speak the language. But we all know how to use chopsticks, eat rice (laughs), so in that sense, it’s mythical China. In fact, just last night, I was reading a very interesting article. It was an interview in the New York Times with Tan Dun, the composer in New York, the one who did the Crouching Tiger score. Now he’s doing new music for China. He said that, very interesting, “I left China for twenty years, so the China I hold is no longer – the ideal China that I left behind is no longer there, but I still cling on to that China that I know before”. Nostalgia, idealism. And in fact he said that mostly Overseas Chinese have that kind of mythical China in their back. … That’s why Chinese don’t see us as Chinese anymore. Because the China that we have is a very China they know. *** Cheuk’s friends are now leaving the terrasse cafe where we were sitting. CLC: Oh, what was my next question… Oh, it’s just the mainland… the new immigrants, they identify very strongly with China, more than immigrants from Hong Kong and immigrants who come from Vietnam. Well, I dunno, we’re all sort of Chinese, but don’t speak the same language. That’s exactly the kind of topics I’m dealing with in my film. I deal with, of course, the immigrants, the first-generation immigrants. But that more or less has a historical framing. I’m more interested in what’s next, in the next generation. I mean, you have a very interesting background. You have this kind of background that I was actually talking about in the, you know, the Madagascar Chinese, the Vietnamese boat people, the whole… You know, I dealt with your family problems, you know, in my film. That’s wonderful because that’s exactly the kind of story that I want to tell. You know, what I call the secondary migration, because people went to Mauritius first, and then from Mauritius they come to Canada. So that’s exactly what your both parents were like. So, it’s that very complicated origins, history that we all carry with us. But there’s one common thread, which is we’re all (of) Chinese descent and that, of course, we all love Chinese food. So, it’s very interesting. You know, I would love to speak to your parents just to see how they communicate, because your father – was he born in Madagascar? CLC: He was born in Madagascar. CLC: In Tananarive. But uh, he left Madagascar and never went back. How old was he? Getting in university here? CLC: Yeah, he came to university here. He actually finished a degree first and came here. What year did he come over? So it’s my generation. I came here in ’69 for my first degree. ’73, I graduated after my first degree and I went for another degree. So, he’s exactly my age (60, we assume) and your mother came as a first wave of Vietnamese refugees. They were coming out before the war ended. When did the war end? ’75? They were the first wave coming out before the Fall of Saigon, so they came to Paris, they came to Montreal. It’s the French connection. So, and then the second wave was after the ’75. Then comes the boat people. Then they go to Toronto… You know, it’s very interesting history. CLC: Very interesting dynamics – how people just move around. Yeah, you saw my Israel film, right? I mean, the guy ends in Israel just because he was in a refugee camp in Philippines and then they said, ok, you either go to the US, or Canada, oh but I want to go to Israel. You end up there, and then you see the daughters growing up there. And so, they become Israelis! It’s a twist of fate. It’s amazing! Italians are (a) more recent phenomenon. Because there were Lebanese… There’s a place called Suriname, which is Dutch Guiana. There is a lot of Hakka Chinese there. So, there are Dutch-speaking Chinese in Suriname and there’s a lot of Lebanese in Suriname. How the got there? Well, something about the Dutch, I don’t know, Jews and Dutch. Somehow they came with the boats (in harbours?) from Holland, and they settled there. This whole transnational migration is very very interesting, to me. Now, of course, the Indians are because of the British Empire. They went as indentured labourers, just like the (Chinese in Trinidad) there’s the migration there. I mean, there are a lot of people who wanted me to do a sequel. And what I would like to do is something like Suriname, where I want to explore the angle of Dutch-speaking Chinese. Well, French I’ve done a lot. You know, like Mauritius. I’ve done French-speaking Chinese. Madagascar. But Dutch-speaking Chinese, that’s very interesting to me! CLC: I had this idea running around in head (!). How about going back to China and visit those small cities where, I dunno, 70% of Chinese used to come from? (the figure is actually 50%, for America) I mean, for instance Taishan, it’s such a small city. But I was reading somewhere that, you know, a majority of Chinese in America used to come from that town (or county). CLC: Have you been to that area? No, I’ve been to Fotsan, Foshan (佛山). And, uh, I’ve not been to Toisan, but I was in Foshan. But, you know, it’s not surprising because nowadays they’re all built with money sent back. You know, people are donating money to build schools, help the village out. CLC: Even back then, you mean. At the beginning of the century. In your movies, you didn’t go to, around Asia, where there are strong, big (Chinese) communities. I wanted to do one in Indonesia, but people told me it was too dangerous, because of the anti-Chinese sentiment. If then if you go there, you arouse suspicion and, you know, you bring trouble to the Chinese restaurant owners. CLC: You’re a photographer too? I’m a photographer too. I like amateur photography. CLC: We’re going to wrap this up with the question: who are you? Uh, very good question! I guess that I have to say that I’m an internationalist. I’m neither Canadian, nor Chinese. Even less Chinese-Canadian. I think I’m more internationalist. I see myself that. And the best… Mr Jiang (in Argentina) is the one who pretty much echoes my sentiments well, what he said. He was, to me, the most deep-thinking character that I met. I had a wonderful conversation with him about music, about Wagner, about Mahler, about Beethoven. And, you know, his favourite movement was Beethoven’s 9th. Because we were talking about brotherhood, you know, with the whole chorus about brotherhood. And that was his thing. So, he wrote a manifesto, an internationalist manifesto, about Chinese and being an internationalist person. So I really adopt his thinking. CLC: Well, thank you Cheuk! 2008-07-08 Regarde les Chinois : Fiona L.
Merci. Mr. Kwan est vraiment un homme tres interessant! Thanks for that! Really interesting and I was not aware of that show which sounds really cool.